I have spent roughly 400-500 dollars with Outmotoring since the purchase of my 1st Gen MCS. I have only had one small issue with paypal not working to complete the order correctly, which was solved as soon as I emailed them. Great customer service, and excellent products at good prices. I will continue to shop with Outmotoring for anything I need for my MINI. Synopsis: Get your shift together. The factory MINI shifter feels a bit vague. In fact, sometimes it's hard to know if you're in 3rd or 5th. To top it off the throws are on the long side which makes racing through the gears on your favorite on ramp a bit sluggish. Replacing the factory shift lever with a adjustable shifter like the Cravenspeed will give you endless flexibility between 0% and 50% WITH NO TOOLS! As the shift throws are reduces the shift knob gets LOWER too! If you prefer the factory knob height you'll want the NM Short Shift Adapter OR the HELIX Adapter. Both attach to the bottom end of the shift lever and give you about 20% reduction in shift throw. 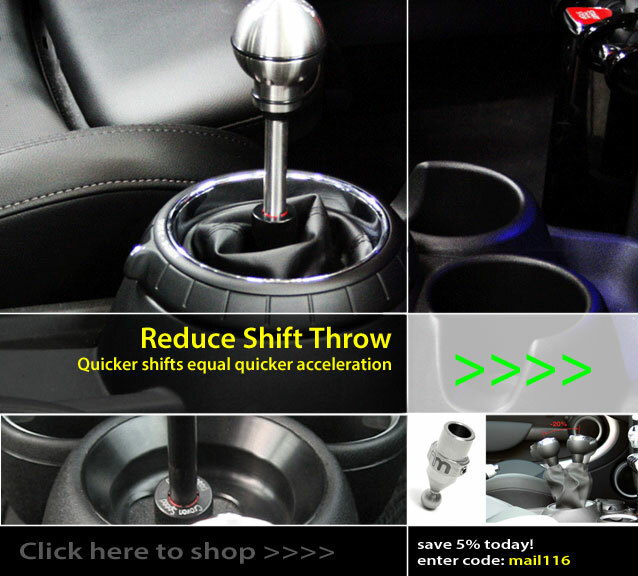 Check out all of our short shift kit and shift knobs here. If your MINI is sick and needs some TLC you'll be glad to know that we're expanding our repair and replacement parts selection daily. If you need a part we don't have just email us the part number. + Be sure to tell your MINI club to order a OutMotoring MINI Club Sponsor Kit for your next event! + Check out our new Product Videos.